Nissan is out to make a statement following the introduction of its all-new Titan XD pick-up truck in the US. 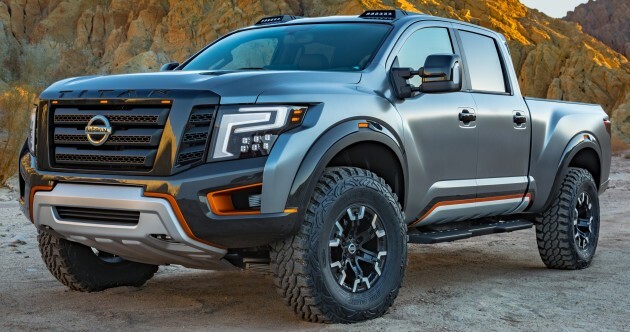 For this year’s North American International Auto Show (NAIAS) in Detroit, the automaker has brought out this, the Nissan Titan Warrior Concept. Ford F-150 Raptor fans, we hope your faith is still strong. Although declared as a concept, the Titan Warrior still utilises the factory fully boxed ladder frame of the Titan XD’s Crew Cab body style. From there, bespoke visual elements are added to create a design which Nissan describes as unapologetic, aggressive and athletic. As no changes were made to the truck’s chassis, the Titan Warrior retains the Titan XD Crew Cab’s wheelbase and length. The concept truck does however get a bump in ride height by 71 mm (from 1,999 mm). Now standing at 2,070 mm tall, Nissan can now fit custom 18-inch aluminium alloy wheels, along with a long-travel suspension setup. The wheels are fitted with large chunky tyres as well, a move that requires widening the truck by 76 mm on each side, bringing the total width of the Titan Warrior up to 2,200 mm. Next, Nissan turned their attention to create a “modern armour” look befitting of a “warrior”. This includes enhancing the Titan’s grille for a more aggressive look, while the front and rear fenders have been flared to promote a muscular outlook. The signature headlights also receive a light makeover, and are now accompanied by custom LED lights. At the rear, a quad-tipped exhaust system is integrated into the rear bumper. Other visual statements include a large front skidplate, as well as a carbon-fibre rear cab spoiler, tailgate spoilers and roof-mounted LED off-road lights. Inside, the Titan Warrior extends the rugged performance look with a strong, angular dashboard layout. There is a custom-built steering wheel that is milled from one block of aluminium, lit panel-mounted gauges and there are auxiliary toggle switches to handle additional off-road accessories. The seats are covered in a carbon-coloured seat fabric trimmed with Magma orange accents. Other interior trim pieces meanwhile, are made of carbon-fibre, polished chrome and leather with accented Magma orange stitching. It’s not all show and no go either. Pop the hood and you’ll find a Cummins 5.0 litre V8 turbodiesel engine and a six-speed Aisin automatic transmission. The mill has 390 hp at its disposal and probably enough torque to pull down a tree, or enough for a Sunday cruise. What do you think of the Nissan Titan Warrior Concept? Would you rather have this or the Ford F-150? Or Dodge Ram 1500? Or something else entirely. One thing’s for sure though, that name, Titan Warrior, is certainly memorable. shutup & take my money pls! Is there anyone gonna say its design like the based on FORD ? If this a proton, Malaysian gonna say it is a copy. This is one badass looking trucker. Imho, exterior and interior wise, it looks futuristic too. Glad they didn’t make a mistake naming it as a Titan Warrior. oic haha, i agreed with you if that looks sure selling like a hotcakes.